Do You Know This Burglary Suspect? On May 5, 2018 at about 8:00 a.m., the suspect pried open the door to a local business located in the 1500 block of North Cockrell Hill Road and took several pairs of Versace sunglasses and a laptop. The vehicle in the video appears to be a Green Kia SUV, possible a Kia Soul, with a red dealer advertisement tag in the front license plate holder. This offense is documented on case number 094933-2018. If you have any additional information concerning this suspect or this offense, please contact Detective Travis McAnally at the Southwest Investigative Unit at 214-671-0546. On April 18, 2017, at approximately 1:50 a.m., two unknown suspects robbed the Red Bird Suites Motel in the 3800 block of W. Ledbetter Drive. The suspects pointed a handgun at the clerk and demanded money. No one was injured during this offense. Suspect #1 is described as a Black male in his 20’s, 5’8″ tall, chubby build, with a goatee and a medium complexion. 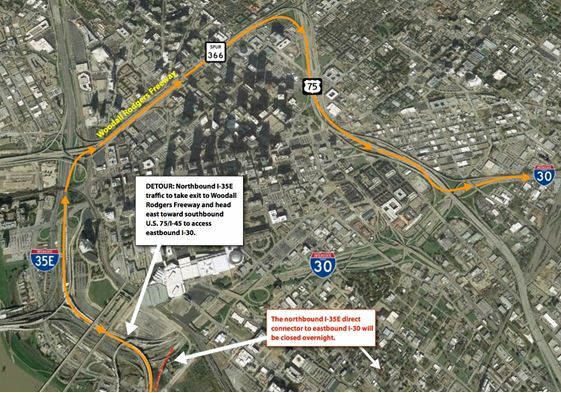 The suspect was wearing a black hoodie, white t-shirt, black shorts, and a black beanie hat. 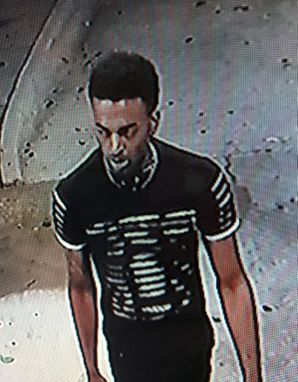 Suspect #2 is described as a Black male in his 20’s, 6’2″ tall, thin build, modern high-top fade haircut, light skin, with a tattoo on his right arm above elbow. The suspect was last seen wearing a black shirt with white horizontal lines and black shorts. Anyone who recognizes these suspects or has information concerning this offense is asked to contact Detective K. Schiver at (214) 671-3655. Please see the surveillance video of the suspect vehicle and the suspect regarding the robbery. On July 28, 2016, at about 1:05 a.m., the 7-11 store at 302 North Marsalis Avenue was robbed by two black male suspects. Suspect one, pictured below, entered the store and made a purchase. When the clerk opened the register to complete the sale, suspect one leaned over the counter and reached in to the cash drawer to steal money. When the clerk attempted to shut the cash drawer suspect one bit her on the forearm and punched her in the face. Suspect one fled the store with cash and climbed into the passenger side of a white Mitsubishi sports utility vehicle driven by suspect two. Suspect one is described as a black male, 25-35 years of age, 6’ 1” in height, weighing 250 pounds, wearing a red T-shirt with horizontal tears, black shorts, and red Nike tennis shoes. The suspect vehicle is described as a white Mitsubishi sports utility vehicle with a sunroof and no front plate. Anyone with who recognizes this suspect or has information on this robbery is asked to call Detective M. Land at (214) 671-3705. The offense is documented on case number 180739-2016. If you wish to remain anonymous you may call Crime Stoppers at (214) 373-TIPS (8477). 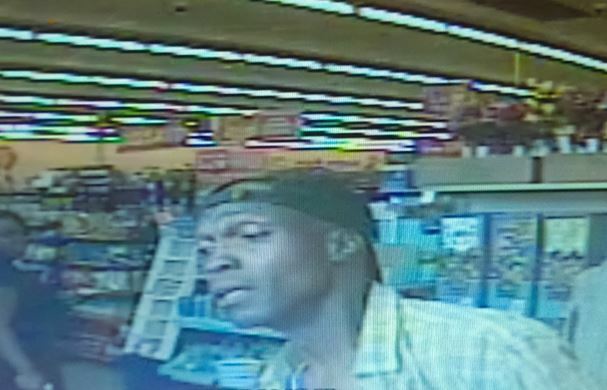 On June 25, 2016, at about 12:05 a.m., the OK food mart at 4343 West Camp Wisdom was robbed at gunpoint. The Hispanic male suspect walked up to the counter, pointed a handgun at the employee, and demanded money from the register. The employee refused and electronically locked the suspect in the store. The suspect tore the door from its hinges and drove off in a dark blue Saturn. 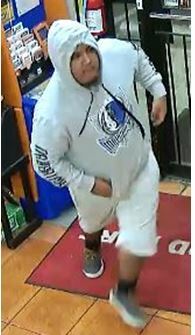 The suspect, pictured above, is described as a Hispanic male, 20 – 25 years old, 5’ 6” in height, weighing 220-250 pounds, with a goatee. 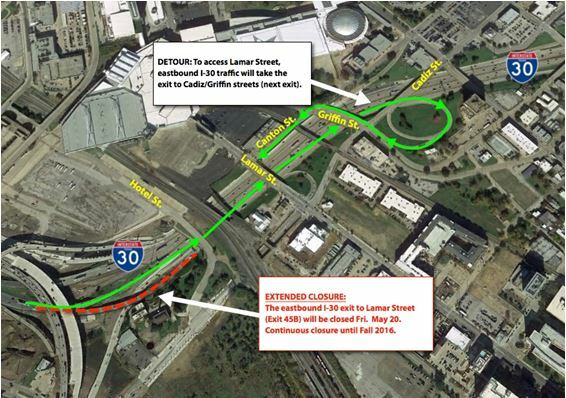 The suspect was wearing a gray Dallas Maverick’s hoodie, gray shorts, and dark gray tennis shoes. The offense is documented on case number 153343-2016. 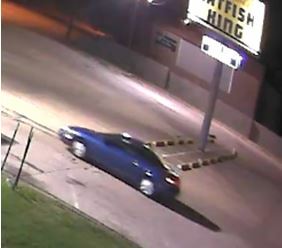 The suspect vehicle, pictured below, is described as a dark blue Saturn 2-door sedan. Anyone who recognizes this suspect or has information on this robbery is asked to call Detective K. Schiver at (214) 671-3655. If you wish to remain anonymous you may call Crime Stoppers at (214) 373-TIPS (8477). On June 15, 2016, a Black male and female suspect went into the Village Jewelry Loan Pawn shop at 3222 W. Illinois. The male suspect attempts to gain entry in the jewelry case while watching employees. When the employees are preoccupied helping customers, the male suspect steals four (4) tires/rims. The surveillance camera at the business caught the suspect on camera and he is pictured below. 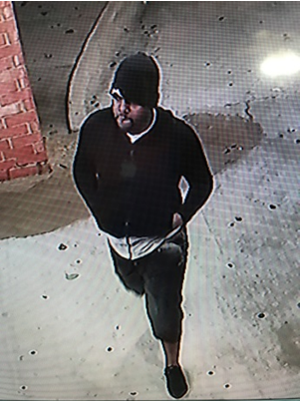 If you recognize this person or have any information regarding this theft, please call Southwest Investigative Unit Detective T. Cleary at 214-670-7471.